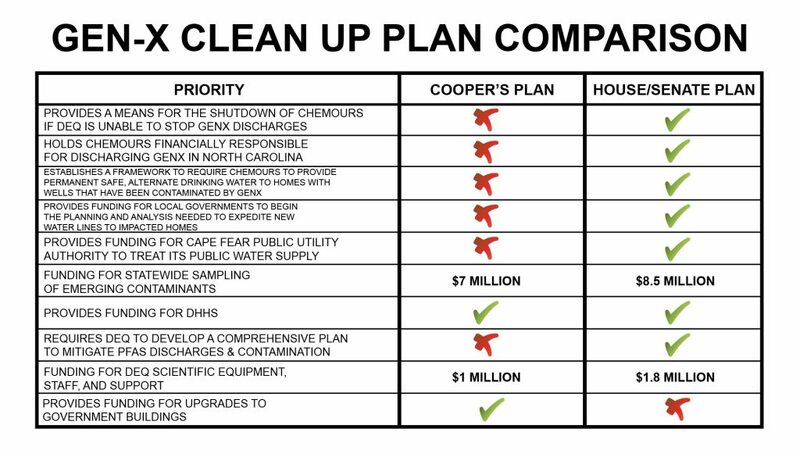 A coalition of House and Senate members representing southeastern North Carolina on Thursday announced a comprehensive plan to help ensure their constituents have access to clean, safe drinking water and to extend efforts to remove GenX pollution from public water supplies. The lawmakers’ proposal is the first to hold the company that discharged GenX into the region’s water supply financially responsible for its actions – even authorizing Gov. Roy Cooper to shut down its operations if the state Department of Environmental Quality cannot stop additional pollution from occurring. Identical bills were filed in the Senate by Sens. Michael Lee (R-New Hanover), Bill Rabon (R-Brunswick) and Wesley Meredith (R-Cumberland) and in the House by Reps. Ted Davis (R-New Hanover), Holly Grange (R-New Hanover), Frank Iler (R-Brunswick) and William Brisson (R-Bladen) following months of study and discussion. The legislation also provides more than $10 million for university scientists and state regulators to continue their research on the amount of GenX and other emerging contaminants in public water supplies, to determine the impact those chemicals could have on public health and safety and to develop a plan to mitigate them statewide. Authorizes the governor to shut down Chemours, effective June of this year, if DEQ is unable to stop further unauthorized discharges of GenX. Provides additional funding to the Cape Fear Public Utility Authority to test a technology to treat its groundwater supply and replicate this water treatment technology in other parts of the state. Establishes a framework to require Chemours to provide an alternate permanent water supply for private wells impacted by GenX above the North Carolina Department of Health and Human Services (DHHS) health standard. Provides $2 million in grant funding to help local governments expedite the extension of municipal water lines to homes with impacted wells. The bill makes clear that Chemours will reimburse state taxpayers for any expenditures from this fund. Provides $8 million for university researchers to conduct statewide sampling and analysis of GenX and other emerging contaminants in public water supplies. Allocates $ $1.8 million for DEQ to purchase a mass spectrometer and hire additional staff to support water quality sampling and analysis and address its permitting backlog.